We like adventure and generally that means being in or around water a lot. Unfortunately iPhone’s really don’t like getting wet. Whether it is being dropped in a toilet, or your kids spill water over it, either way if water is entered into the mix the iPhone may be broken. At the Mighty Eagle we spend a great deal of time exploring and recording all our adventures and sharing through social media, and recently the worst happened; iPhone into a river. Honestly, it wasn’t my fault, got stung by a wasp. True story. 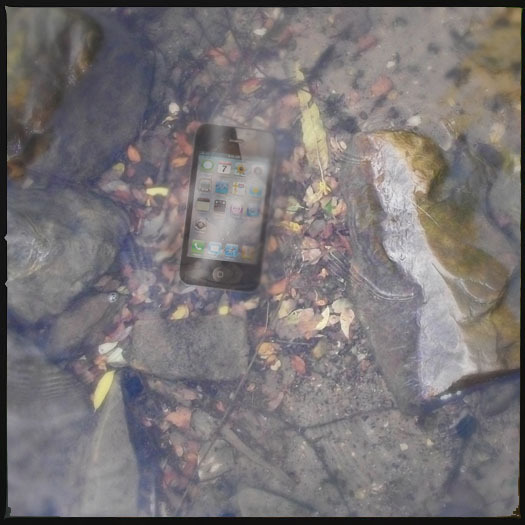 And the phone went sailing into the water. Deep water. Firstly, did you know that a hat helps you see underwater, because it creates shade to reduce the glare from the sky behind you? Don’t pop your head under water, just close enough that you can create darkness. You need to create shadow so the water is brighter than the reflected sky. That way you will be able to see below the surface. Secondly, use a large stick to pinpoint where you last saw it. It is quite easy to lose your bearings, so mark the point it was last seen and work out from that point. Amazingly our dropped phone was still on, and shining out from the depths like a beacon. Thirdly, retrieve it quickly and remove as may parts as you can such as covers and SIM housing to let the water drain out. Then, try and turn it off so the chips don’t short circuit. When you get home, get the iPhone into our new Mighty Eagle Dry-Phone phone rescue kit. We developed this product to help save our own devices after my daughter and a friend had similar accidents and plunged their iPhone’s into toilets! The Dry-Phone gets to work immediately drying your iPhone, blackberry or any other precious device. We now carry one everywhere. Just in case! IMPORTANT! Don’t charge it. Leave the phone for anywhere between one and three days to dry out, then try to charge it up. You may want to ask your network provider if they can forward your incoming calls to another number while you pace up and down waiting for your iPhone to dry out. Good luck and we hope you rescue your phone. Thankfully this one dried out overnight. Buy The Mighty Eagle Dry-Phone now!